From The Pen Addict’s Podcast Episode #233 (https://www.relay.fm/penaddict/233), we were challenged. If you had $500 and you can buy three pens, what pens would those be? I’ll be honest — I didn’t listen to the podcast, but when Pam first asked me, my immediate question was “MSRP, or how much I paid for the pen used?” But, I guess to be fair, we’re going with fair prices, not crazy deals. 🙂 My three would be my Doric (I paid $275 for it at a pen show, so I assume that’s fair? :P), a Pilot Vanishing Point with a fine nib ($90ish off eBay) and a vintage Pelikan 400 with a fine nib, ideally a soft one (~$120 in green most likely, since I’ve never seen a Tortie one below $140 ish, but I have purchased two greens and a black for $120 or under). If I was only allowed modern pens… A Pelikan M805 in extra fine (EF) nib (~$350 from the UK), a Pilot Vanishing Point also with an EF nib (~$90ish), a Kaweco Sport with a broad nib ($25), and, if it’s allowed, a 1.1 calligraphy nib for the Kaweco ($12). I loved the idea of the $500 game because it really highlighted to me what pens I would recommend to a budding pen lover who is on a relatively limited budget. 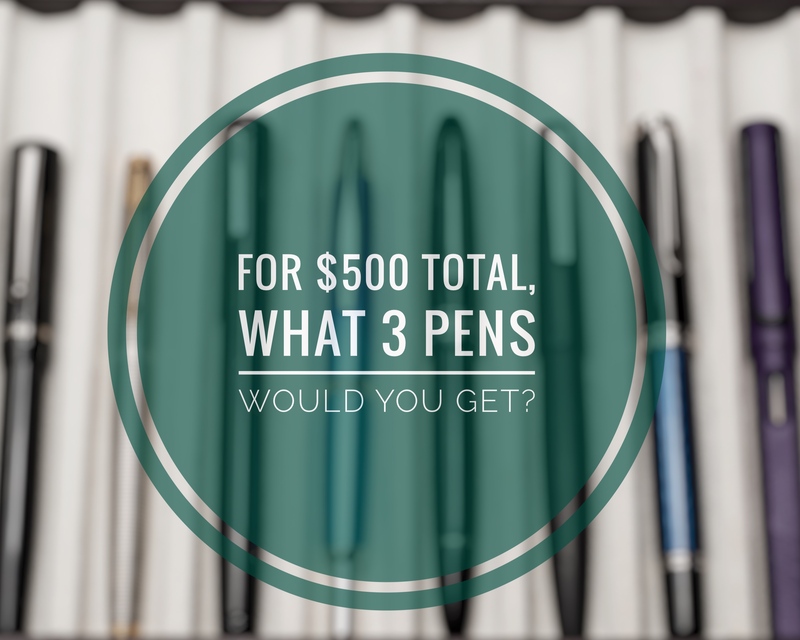 Or the better question for me was what would be the three pens I would want to buy and use regularly if I only had $500 to spend on pens for the foreseeable future. (This is a possible future since my “new year’s resolution” for 2017 is to “Save more and eff up less.”) I don’t see the “savings” part standing for very long when I am surrounded by such amazing pen friends, writing instruments, ink and stationery. My choices are the Lamy 2000 in an EF nib (~$160 via Goulet Pens), a Sailor Pro Gear Slim, transparent model with rhodium trim, in EF nib (~$160 via Anderson’s Pens) and Brute Force Design’s Pequeño in Amber Tortoise acrylic with a fine or medium nib so that Katherine can experiment grinding the nib (~$145 from Brute Force Designs aka Troy Clark). Leftover money would be for ink from Vanness. My choices for ink would be: Bungbox Omaezaki Sea, Sailor Yama-dori, Pilot Tsuki-yo. Okay, it definitely was a difficult task but I think it became a learning experience and taught me what I would want other than Pelikan pens. So the first pen would be an Edison Huron from the Signature Line of the Edison Pen Co. ($250), and I will ask him to do a cursive italic grind on a broad nib ($40). Next would be the Franklin-Christoph Model 03 Anderson Pens Special Edition with a medium nib ($165). That blue marble acrylic is just something else! And the last pen would be a black TWSBI Eco with a fine nib (~$30 from Goulet Pens). And I still have $15 for a nice bottle of Noodler’s Liberty’s Elysium, or Sailor Yama-Dori. What would you choose for the $500 game? Better yet, what are you getting for the pen lover in your life? For moderns, my three would be a Franklin Christoph 03 with a gold Fine, a Pilot Decimo EF, and a used Pelikan M200/M205. All have replaceable nibs so the person can try a decent range of widths and grinds as he or she sinks deeper into the hobby. Those are some good choices Karlo! Having a Pelikan in the 3 sure makes sense. And yes, shooting ink especially with a snorkel seems fun! Assuming that’s $500 US, I’d get a Pilot Decimo Vanishing Point, a Lamy LX in rose gold finish and either a Waterman Carene or a Pilot Elite E95. Come on, what world are we living in? There are going to be a *lot* of people in your audience that are going to be hard pressed to squeeze out a 1/5 of that for buying pens. When I see people buying higher-priced pens, or a bunch of pens that total to a larger sum, I’m at least honest about the fact that they actually don’t have much in the way of budgetary constraints. You probably have spent too much time. Haha! j/k! But yes, you’re not wrong at all. Especially when I was starting out, it was very difficult to get above the $100 mark. But that moved up quick even before the joining the SF Pen Posse. That Premiere Cappucino is a winner! I could be happy the rest of my life with these three pens if I had to have just three.